If you've been eying a reason to cut the cord when it comes to cable, you might have been thinking about going with the PlayStation Vue service, which acts as a viable alternative to cable service. 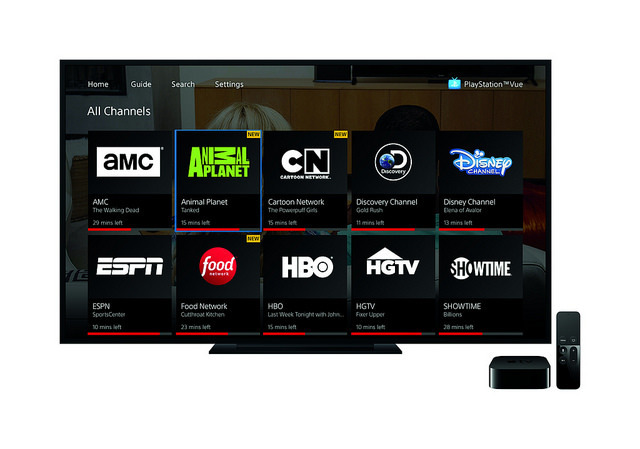 It includes cloud DVR programming, streaming, live TV and more. It just lost its Viacom programming unfortunately, however, so that's a pretty big dearth of channels, but there's one bit of news that might make it appealing for you: It's coming to Apple TV. Previously PlayStation Vue was available on iPad, but it's just now being made available as an app for Apple TV, especially with Apple launching a new unified TV experience next month with the "TV" app FOR tvOS devices. You'll be able to use the same service as a single sign-on for several differente existing cable providers for you to stream content. So if you've been looking into PlayStation Vue and you have an Apple TV, this might be your next big investment.